Those of you who are regular readers of this blog know that we have been taking a journey towards totally clean living for the past year and a half or so. Experiencing cancer seems to have that effect on a lot of people--you want to do everything you can to keep it away. One of the things that we changed soon after we began our journey was toothpaste. Now, you may be thinking, "why is changing toothpaste important? It is not something you swallow." First off, your mouth acts as a vehicle to absorb chemicals into the bloodstream very rapidly. The time for those chemicals to be circulating in your bloodstream is super short. That is why there are many pills that you simply place under your tongue. Second, even though you do not intend to swallow the toothpaste, some of it does get inadvertently ingested. So, we decided to select toothpastes that we wouldn't mind actually ingesting. When we first began looking at ingredients in toothpaste, we were shocked by what was actually in the stuff that we purchased regularly and placed in our mouths multiple times per day. and, a long list of other unpronouncable chemicals. When we continued to look for a totally clean toothpaste, we even found that some of the "cleaner" toothpastes we viewed the ingredient list on at Whole Foods and Natural Grocers contained things like carrageenan (which we are staying away from for reasons listed in the link). So, like many personal care products, we were left with the obvious solution to simply make our own. And believe me, it is super simple. The recipe we like includes approximately 4 parts xylitol, 4 parts coconut oil, 4 parts baking soda, 1 part Pink Himalayan Sea salt and however many drops of peppermint oil I feel it needs depending on the size of the batch. There are obviously specific reasons each of the ingredients were selected. The xylitol prevents decay and assists to remineralize. (Although it has been touted as a "healthy" substitute for sugar in food, I would not use it as a sugar substitute, and I am only using xylitol as an ingredient in the toothpaste for the very specific reasons listed. Xylitol can, however, be omitted from this recipe if you are not comfortable with using it.) Coconut oil acts as an antibacterial and antifungal. Baking Soda is alkalizing and acts as an abrasive (and therefore, teeth whitener). Himalayan Sea Salt contains 85 minerals, stops bad breath, draws out pathogens and kills bacteria. And lastly, pure peppermint oil has numerous beneficial properties. But, it is mainly nice in the toothpaste for the flavor. We put our toothpaste into little containers that have screw-on lids. I bought the containers at the local grocery store (HEB) for around $1. It is super easy for you to put the paste into the container by unscrewing the lid and placing the paste into the large opening. Then, you screw the lid back on, and the lid with the pop-up cap has a smaller hole where the toothpaste squeezes out. I have found that, at times, the toothpaste gets hard to squeeze out. When it does, I simply run the tube under hot water to get the coconut oil to melt a bit. Honestly, I think when I make the next batch I am just going to store the toothpaste in a small mason jar and use a little metal utensil to place onto the toothbrush. You can also reuse your current toothpaste containers by cutting off the end of the tube, placing your homemade paste in there and then rolling it back up. At first, I found the toothpaste to taste a bit salty. But now, I actually love it. 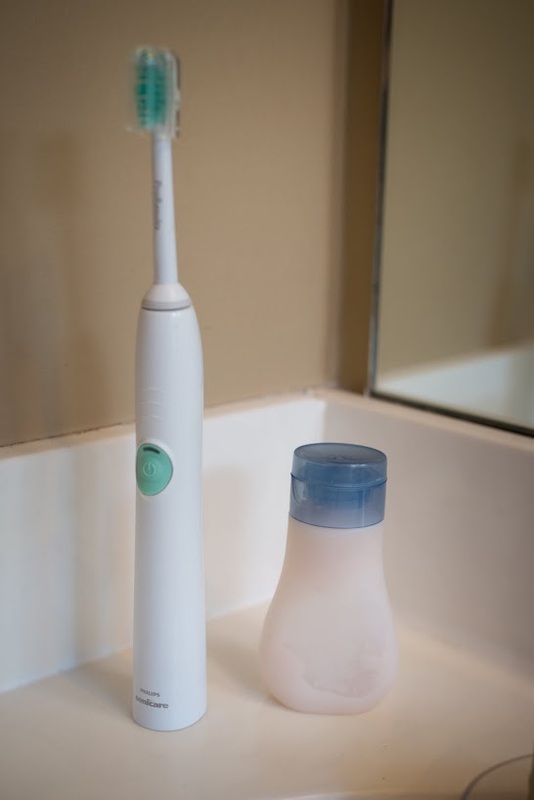 And, combined with one of my favorite personal care products, the electric toothbrush (Philips Sonicare Easyclean), my teeth feel like they were just cleaned at the dentist each time I brush my teeth. I decided to write up a quick post because I have been meaning to for a while now, and this information is just too good not to share. Enjoy!